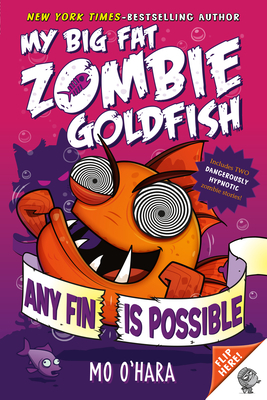 More hilarious adventures and zany illustrations in the after life of a zombie goldfish! When Tom rescued Frankie the goldfish from his older brother's evil science experiment by zapping him back to life with a battery, he never expected his pet to become a BIG FAT ZOMBIE GOLDFISH with incredible hypnotic powers . . . but he has to admit it's helpful, especially when they are thwarting his big brother's evil plans. Dodging booby traps, avoiding evil possibly-mummified kittens, discovering the truth behind the ancient Egyptian Curse at the local museum . . . it's all in a night's work for a zombie goldfish! Then, there's something fishy going on at sports day. Can Frankie help Pradeep and Tom to foil Mark's evil plans? Or will Mark and his pet vampire kitten, Fang, take home the gold? New York Times-bestselling author Mo O'Hara delivers more laugh-out-loud fun in this illustrated chapter book series.